Losing a baby is devastating. You do not only lose your precious little one, but you lose your hopes and dreams for a future with your child. The family and friends of bereaved parents often want to help and support their loved ones as much as they can, but struggle to know what they can possibly do to make things any easier for their loved one. * The first thing to recognise, is that nothing you can do or say will make things easier. But, by offering your support you are showing your loved one that you may not fully understand what they are going through, but you care about them and you want to support them as much as you possibly can. * It is important to accept that your loved one has had a life changing experience, and therefore it is very likely that they will have changed as a person. Losing a baby is not something they will ‘get over in time’. When a baby dies, you lose an entire lifetime of hopes and dreams. They will love, remember and miss their baby for the rest of their lives. Your loved one will find happiness again, but it will be a new kind of happiness – and there will always be an empty space in their life that their child should have filled. Accept that this loss may change your relationship with your loved one. They may behave in a way that you do not think is reasonable, but try to be forgiving and remember that they are in unimaginable pain. * Let you loved one know that you are there to listen to them, and actually do listen. Giving out advice may not be helpful, especially if you have not experienced losing a baby yourself. Ask them if they would like to tell you about their baby. Be honest – if you do not know what to say, let them know. Do not try to ‘fix’ things and offer answers – just let them know you are there for them. But do not push your company on them if they are not ready to spend time with people just yet. It many be many weeks or months before your loved one is ready to face the world – give them space but keep contacting them to let them know you are thinking of them – even if they do not reply. * Help in practical ways – drop off shopping or pre-cooked meals. Their mind will not be on grocery shopping and it can be very easy to run out of essentials. Ask if there are any errands they need you to run. If they have living children, ask if they would like you to take them out for a little while. Rather than asking “Is there anything I can do?”, try asking “Can I drop off some dinner for you?”, “Can I take the children out?”. 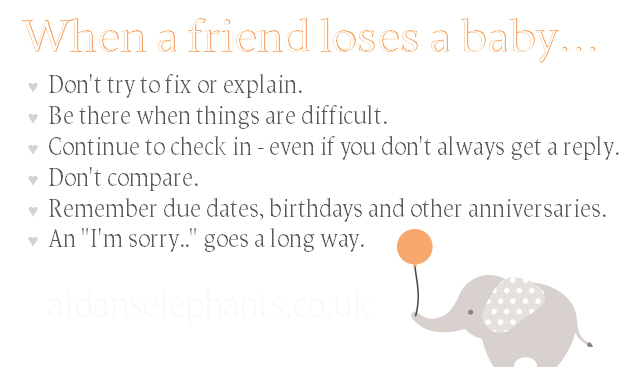 * Don’t be reluctant to acknowledge your loved one’s loss or use their baby’s name. You may be afraid of upsetting them, or causing them to cry, but please know that those tears were waiting to fall and that for many parents, talking about their child helps them to feel close to them and to keep their memory alive. We dreamed of a life spent saying our child’s name, and to be able to say it now and hear others say it is often a blessing. * Write down special dates such as the baby’s birthday or due date,so that you remember them. This will mean the world to your loved one when the time comes. Bear in mind that holidays are particularly difficult times. On dates such as Christmas, Easter, Mother’s Day and Father’s Day, remember that your loved one’s baby is missing, and that this is a very sad time for them, even if they have living children. Writing in a card that you are remembering their baby with them during these occasions will mean the world to the family. Often, parents feel that months and years after their baby has died, people have forgotten about them. Let them know that their baby is in your thoughts, no matter how much time has passed. * Be mindful about whether your loved one is religious or not, and try not to impress your own beliefs on them. If your loved one does not believe in God, telling them that their child has gone to be with Jesus will not be helpful to them. Try not to use words such as “he/she is in a better place”, we can guarantee that your loved one believes that the best place for their baby is in their arms. Whether they baby may or may not have had a disability does not matter and it is hurtful to be told that there is a better place for your baby than with you. Also try not to use phrases such as “Time heals all wounds” and “You’ll get over it”. If you have children of your own, try for just one second to imagine losing one of them and think about whether you would get over it. Your loved one’s baby might have died before or shortly after he or she was born, but this does not make them any less important to your loved one than your child is to you. They may not have had years to create memories and this might lead you to think that they will miss their child less, but they are missing the hopes, dreams and plans that they had for spending a lifetime with their child. They will learn to let their life grow around their loss, but your loved one will never ‘get over’ losing their child. * Do something in honour of your loved one’s baby. It does not need to be a grand gesture or an expensive one. You could light a candle, plant flowers in your garden, release a balloon or a sky lantern. Many parents love to see their child’s name. If you see something with their baby’s name on, send them a photograph and let them know it made you think of their child. You could write their baby’s name at the beach, paint it onto a pebble and send it to them, or write it on a balloon and release it. * Read online articles and magazines such as Still Standing Magazine, to find out about how other families/friends have helped their loved ones who have lost a baby or young child. Although you will hopefully never fully understand the reality of the grief that comes with losing a child, by reading other people's experiences you may be able to gain some perspective on your loved one's 'new normal'. Please remember though that everyone's journey is different, just as everyone's way of grieving is different. * If you would like to send something to your loved one who has lost a baby, please try to avoid flowers where possible. Flowers wilt and die, and are a sad reminder of death. If you want to send flowers, try to find a flower that has an appropriate meaning and tell your loved one the meaning. For example, baby’s breath means “pure of heart and innocent”, and pink carnations mean “I will never forget you”. * Sending a sympathy card when a baby has died, is a personal choice. Often, traditional sympathy cards don’t say the right words and don’t seem appropriate. Many parents keep and treasure the sympathy cards that they are sent, as a reminder of their baby’s importance to other people. If you are looking for a sympathy card for someone who has lost a baby, you can find a beautiful range online by searching for 'baby sympathy card' via Google. Some larger card shops (such as Clintons) also now stock a small selection of baby sympathy cards. 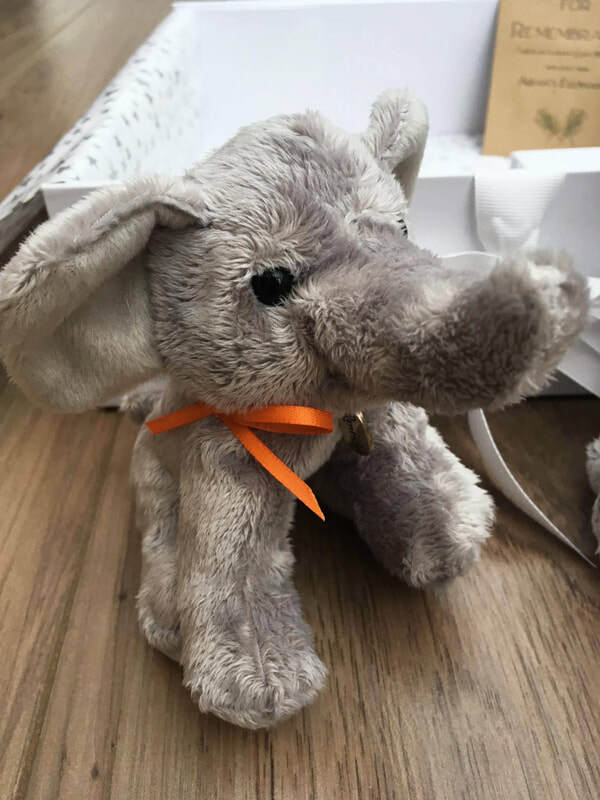 * If you would like to send a small gift, you might like to consider sending a keepsake box to keep the baby’s special items in or a journal for the parents to record their thoughts in. If you know that the parents have photos of their baby (ultrasound photos, or photos of the baby), then a frame personalised with their baby’s name or a pretty photograph album or scrapbook would be a thoughtful gift, as would most things that can be personalised with their baby’s name (jewellery, candle holders, etc). On our website you can find a list of books which may be helpful to parents/families who have lost a baby. If you do decide to send a book, please try to find one that you think will be appropriate – if your loved one is not religious it is a good idea to avoid books that have a religious theme. If you are a bereaved parent who has passed this page on to a friend or family member - please let us know. Many people find our website by searching the Internet for advice about how to help a friend or family member who has lost a baby. You can help us to provide as much information as possible, by sharing what you wish your family and friends had known, and what you were grateful that they did do. Thank you so much for your support.